Dr. Nessler received his orthopedic training at the Rochester Mayo Clinic. He has a specialty practice in hip and knee joint replacement as well as revision joint replacement. Dr Nessler joined St. Cloud Orthopedic Association in 1991, and is a member of the American Academy of Orthopedic Surgeons as well as the American Association of Hip and Knee Surgeons. Dr. Nessler is a consultant for Stryker Orthopedics, a world wide leader in Orthopedics implants and Robotics for Orthopedic surgery. 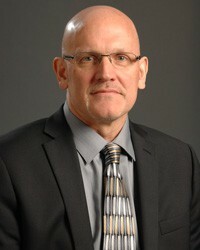 Currently, he consults in the development of new surgical techniques, clinical testing of new implant designs as well as computer and robotically assisted surgery. Dr. Nessler has developed a muscle-sparing hip replacement technique in conjunction with Stryker. In July, 2004 computer assisted navigation was incorporated into his hip surgeries. Navigation in knee surgeries began in January 2005. Robotic assisted surgery in conjunction with muscle sparing hip and knee techniques now allows Dr. Nessler to offer quick recovery and outpatient hip and knee replacement procedures to patients that qualify. In July, 2007 the St. Cloud Hospital was ranked as one of the top 100 hospitals for Orthopedic Care with the Mayo Clinic and Abbott Northwestern the only other Minnesota hospitals selected in this field. In 2008 the St. Cloud Hospital's Orthopedic program moved up to 35. In October of 2014, in conjunction with the Saint Cloud Surgical Center, Dr. Nessler started a program in outpatient knee, hip and partial knee replacement. Robotics and computer navigation are utilized to provide the most accurate, patient specific surgical procedure available.